This chilled summer soup is a perfect way to enjoy seasonal fresh vegetables. Place the tomatoes, bell pepper, green tomato, jalapeno and garlic in a large baking dish and drizzle lightly with olive oil. Broil on high until the vegetables have some light charring – about 8-10 minutes. 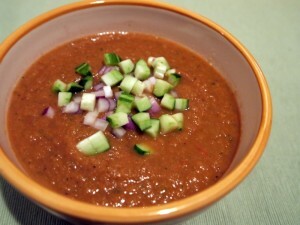 Put the broiled vegetables, onion, cucumber, lime juice, and vinegar in a large blender and process until smooth. If the consistency is too thick, you can add additional tomato juice or vegetable broth. Season with salt to taste. Let the gazpacho cool or chill slightly in the refrigerator before serving. Serve with finely chopped fresh vegetables and herbs to garnish each bowl.